I am installing led lighting in my Hornby coaches. Have come up with problems in over coming the plastic insutated bush as fitted to all coach wheels. I have tried soldering across the plastic bush.Not an easy task as the axle & wheels in particular are not readily easy to apply solder too. When I do finally get solder on it ends up with a blob of solder which causes other problems. I have also tried Conductive silver paint but that was not very successful either. Both the above leave obvious signs of application which look unsightly . Does anyone know where you can obtain metal bushes to replace the plastic ones? Or any other suggestions would be appreciated. 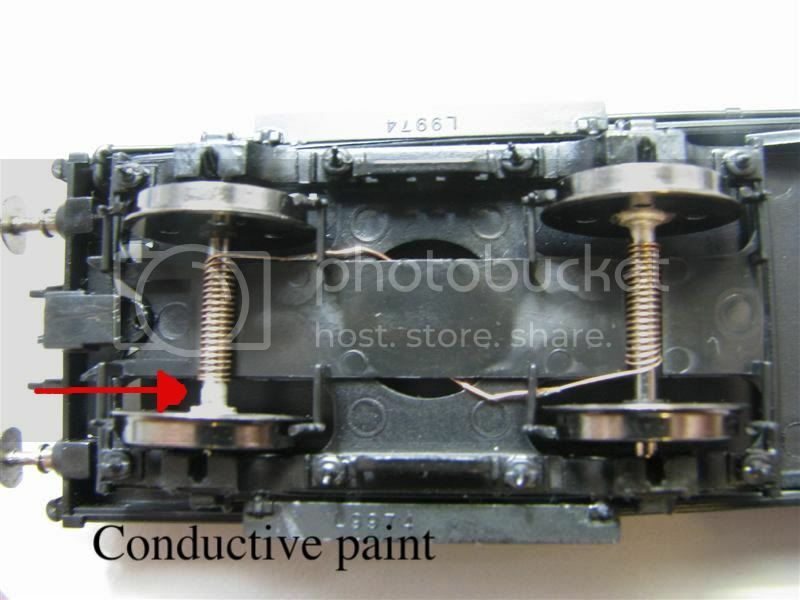 You can try soldering a thin multi strand wire to a piece of phosphor bronze, or nickel silver strip, and then glue this to the bogie frame. Position it so that it can be bearing on the back of the wheels without sticking out like dogs balls. I've done this before for extra pick ups on old Lima stuff. It's quite easy, cheap and effective. This might be worth a read on how to add lighting to coaches and it includes pickups also. Silver conductive paint can be a bit funny at times. Shake the bottle really well and then turn up side down for about 1 minute, more silver starts settling in the cap. This is where I take it from and paint onto wheels. Try this..... I sometimes use single core wire, strip insulation fully and using superglue or epoxy glue between axle and wheel over bush. Then add conductive paint. I also remembered that sometimes the inner wheels have a light coating of oil or wax which acts as a bit of an insulator when you add conductive paint. So give it a clean with meths etc. Before putting the wheel into the bogie test it with a multi meter. Put it on the ohms setting (looks like an up side down horse shoe) and you should get "0.L" This means their is no resistance on that circuit. Or you can just try the continuity test which is on you multi meter again. Once you get a feel for it testing will become second nature. All in all I love the stuff it works some real magic for me. 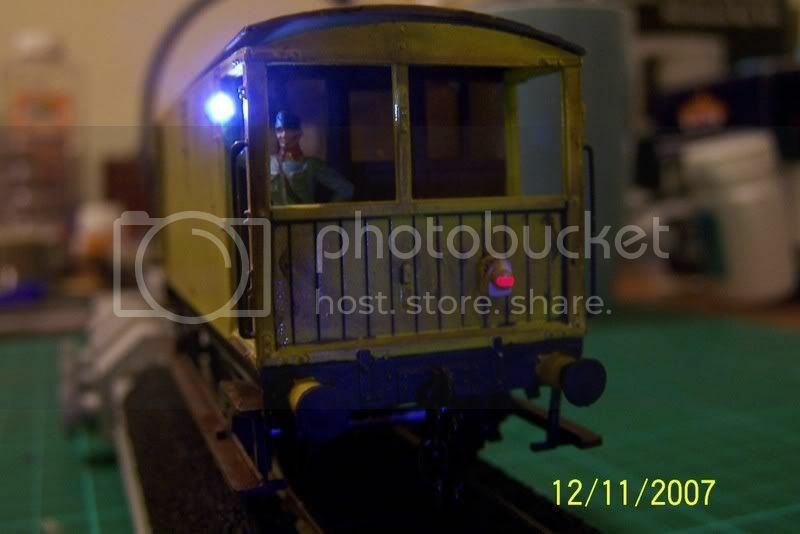 The light in the guards van and the brake light are fed using silver conductive paint. I must upload some more using conductive paint. Pickups before flicker free I liked to make my own as I needed constant contact with the wheels. Now I use these pickups. I just pop them on and I am not to worried if I only get power 70% of the time as the cap takes care of the rest. If you are not using some sort of power storage like flicker free you need 100% pick up 100% of the time. Tri-ang had an inovative pick-up system that would have been ideal for the job. It can be found of lighted MK1's, the coaches came with one wheel on a metal axle made of plastic and the other was metal and a set of metal pickup wipers made contact with the axles to pick-up power. They can still be found easily on scrap lighted early 1970's MK1's. The wipers had a central round piece that went up into the bogie pivot to stop the wipers moving about. One bogie picked up from one rail, the other bogie picked up from the other rail. It was simple and very effective, shame Hornby don't make the wheels and unit as a DCC accessory today. Martin71's solution is pretty close to the Triang system. son of triangman wrote: Tri-ang had an inovative pick-up system that would have been ideal for the job. It can be found of lighted MK1's, the coaches came with one wheel on a metal axle made of plastic and the other was metal and a set of metal pickup wipers made contact with the axles to pick-up power. They can still be found easily on scrap lighted early 1970's MK1's. The wipers had a central round piece that went up into the bogie pivot to stop the wipers moving about. One bogie picked up from one rail, the other bogie picked up from the other rail. It was simple and very effective, shame Hornby don't make the wheels and unit as a DCC accessory today. AFAIK, Tri-ang/Triang Hornby never made any of their Mk1 coaches with lights added. It was Triang Hornby that introduced the Mk2 coaches with added lights between 1968 & 1972. No's R722 M5120 TSO & R723 M14052 BFK. The pick up for the lights to operate was a plastic insert fitted to the underside of the bogies with two brass studs held on the axles by two springs with two wires taking the power from the track through the metal eyelet to the bulbs in the coaches. The main problem with their method of the brass stud and spring pick up was, that it caused drag on the coaches and therefore reduced the number of coaches a locomotive could haul. Effective, yes but only viewed as a gimmick back then. I have Tri-ang-Hornby equiped Mk1's K9-70 and know where there are more, must be very rare. the system did give some drag, but a modern equivalent would work well me thinks. I know about the MK11's, I have some of those as well. Location: Throwing and sweeping stones out on the ice somewhere in Scotland. The only time I EVER saw that was when a School friend of mine at the time got a Hornby set and the coaches had pick ups on the bogies for lights. I cannot remember at all what set it was, but I'm sure it was Mk 1 coaches. This, I have to add was in about 1992, before I really knew the differences between all the different types. I've always wondered whatever happened to those coaches, and why it wasn't carried on with by Hornby. Any idea what set this might have been?? it came with a, (I think) a small steam loco. A bunch of sewerage farm workers from the North West were visiting Blackpool on a day trip when one of them was overcome by the fresh air and fainted. It took 7 buckets of S**t just to bring them round again! For the record, I would have been 9 or 10 at the time, so please excuse me if I can't for the life of me remember what set it was! To be fair, all I can really remember about it was the lights in the coaches! Martin71 I like the look of your pickups.I will have to persevere with the conductive paint method using the advice you give. Thanks for the link I have been to DCC Concepts site before & seen the excellent work & advice they give. 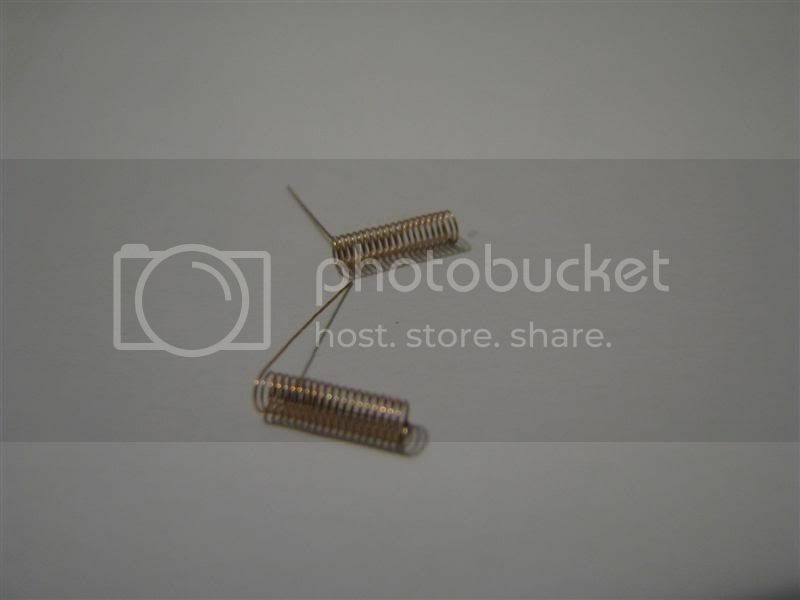 I made up my own pickup coils which work fine. I am using SMD yellow leds & smd resistors which although involves delicate soldering makes a compact job. They are super glued to a thin sheet of perspex with a lenght of self adhesive copper strip providing the supply/return. Tucked away one end is a 470UF capacitor & the othe end a smd bridge rectifier. Took a bit of time getting it right but I am very happy with the end results once I have sorted out the pickups. There are two leds for each comparment & four in the corridor. Not sure how much power six coaches all fitted out with lights is going to draw. Will have to sit down & work that out later. More to the point, is there a big database somewhere with all the models ever produced?? Surely someone must know what that set was!! An updated system with LED's instead of bulbs from Hornby is surely long overdue, they have the mould. C'mon Hornby what's keeping you? son of triangman wrote: I have Tri-ang-Hornby equiped Mk1's K9-70 and know where there are more, must be very rare. Triang Hornby introduced only the Mk2's with lights between 1968 to 1972 in two batches with different running numbers. I remember seeing the Mk2's advertised in the 1968 catalogue. From memory, the lighting units for the Mk2 coaches was also sold as an accessory that you could fit into earlier Tri-ang/Triang Hornby coaches. As I said earlier, AFAIK, Tri-ang/Triang Hornby never made any of their Mk1 coaches with lights added. I would suggest that the Mk1's you have with lights, was added by the previous owner when the lighting accessory was introduced. Mine are original shop stock K9-70, they must be incredibly rare, will have to stop selling them.